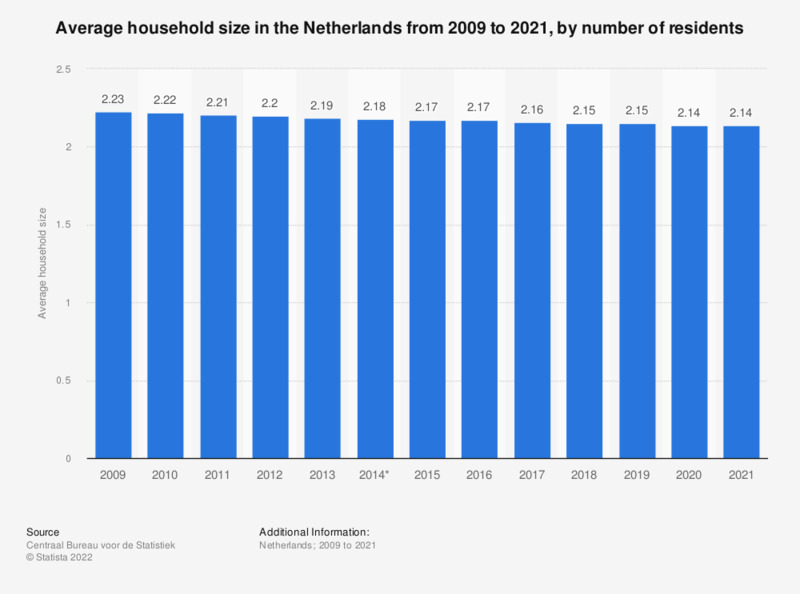 This statistic displays the average household size in the Netherlands from 2008 to 2018, by the number of residents. It shows that the average household size in the Netherlands between 2008 and 2018 barely changed, from 2.24 people per household in 2008 to 2.15 people per household in 2018. A historical overview is provided here in this statistic, which shows the development of the average household size in the Netherlands since 1950. It shows that from the 1950s onwards, the average household size continuously decreased, from approximately 3.9 people in 1950 to roughly 2.2 people today. As a downward trend is visible in the last 66 years, a further decrease in the average household size can be expected too in the future. This is confirmed by this recent forecast, which shows a particular increase in the number of one-person households is likely to take place. Figure valid as of January 1 of each indicated year. * As of 2014 ca. 35,000 persons that were initially considered one-person private households are now counted as living in institutional households. This also had a slight impact on the average household size, as the total number of one-person private households increased because of this.